Third floor two bedroom apartment. Extending to approximately 71 sq. m (759 sq. ft). 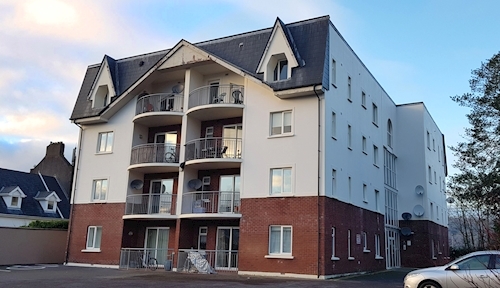 Subject to a tenancy at a current gross rent of €13,200 per annum. Cork City is located in the south west of Ireland approximately 100km south of Limerick City and approximately 125km southwest of Waterford City. The subject property is located along the Castle Road to the west of Cork City. Amenities in the area include Mahon Point shopping centre and a large range of schools, shops, bars and restaurants. Transport links in the area include the N28, the N40 and Cork Kent Train station. Comprised within a building arranged over ground and three upper floors. We are informed that the subject property extends to approximately 71 sq. m (759 sq. ft). The property is subject to a tenancy at a current rent of €13,200 per annum.